hen Shelley Jordon was a little girl growing up in Brooklyn, she got in trouble for pulling her mother’s books off the shelves and drawing in the white spaces. Her need to create was so strong that she couldn’t resist, despite knowing her mom would be angry. When Shelley Jordon was a little girl growing up in Brooklyn, she got in trouble for pulling her mother’s books off the shelves and drawing in the white spaces. Her need to create was so strong that she couldn’t resist, despite knowing her mom would be angry. Many years later as an adult reeling from the news that her husband had a brain tumor, Jordon followed a similar urge. She printed out his MRI scans and started painting on top of them, covering them with her brush strokes, using personal imagery to come to grips with her fear. Jordon, a professor of art at Oregon State University, has been an artist ever since she can remember. Painting has been not only her life’s work but also a lifeline during difficult times. Through trauma and transition, she has drawn from personal experience, but the feelings she captures are universal, grounded in the daily events that we share with the people who are closest to us. Her early focus on still lifes took a dramatic turn with the uncertainty of her husband’s condition. Interpreting objects on a canvas was no longer enough to express her day-to-day feelings. She needed her pictures to move, to express a reality that was not fixed and a future that was in doubt. Adapting her work to a life in flux, she transformed herself over a period of several years from a renowned still-life painter to a creator of award-winning hand-painted animated movies. Before Jordon’s domestic life was upended by her husband’s illness in 1995, she had earned a national reputation as a creator of still-life images. Throughout the 1980s and 1990s, she worked steadily, focusing on the objects in her daily surroundings. 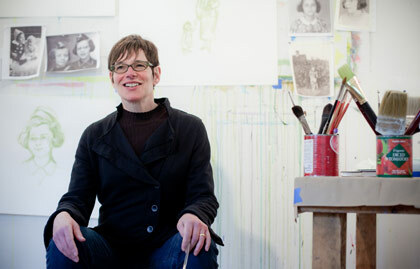 Her work was featured in a one-person career retrospective at the Frye Art Museum in Seattle. Other exhibits followed: the Oregon Biennial at the Portland Art Museum, the Northwest Biennial in Tacoma, Washington and galleries in San Francisco, Chicago and New York. Jordon, her husband David and their young daughter Clara were in Italy where Shelley was teaching as a visiting professor. Her husband fell ill, and they came home to Oregon early, only to receive the news about his brain tumor that was to refocus their lives. “Thankfully everything worked out okay, and he is fine now, but that period from diagnosis to recovery really blew me open. And I started doing work as much as to keep myself sane, but also it took me down an entirely different path,” Jordon says. Jordon started grasping for something new but didn’t yet know what she would find. In her grief and anxiety, she couldn’t even think about painting a vase, a flower or a rooftop. “I didn’t want to even look at those then. And I didn’t know what I wanted to do,” she says. In the spring of 2009, Jordon was a visiting artist at the American Academy in Rome when an earthquake struck the city. Aftershocks occurred every night for a week. The result for Jordon is perhaps her darkest and most accomplished work to date, a six-minute animation called Terremoto (“Earthquake” in Italian) that combines images from Roman mythology and history with an unsettling, jittery feeling. It is set to music by composer Kurt Rhode, who was also at the academy in Rome. “Every night the room started shaking and my heart was pounding, and I soon couldn’t tell if it was an earthquake or my heart pounding anymore. One trauma brings up another trauma. These ideas of trauma, the illusion of safety, the fragility of human life are all very important for me,” she says. Those themes show up in another animated installation that Jordon exhibited in May 2010 at Marylhurst University. “Morning Coffee” was part of the Motherlode exhibition for Mother’s Day. Jordon set a small breakfast table with linen, a morning paper and a cup of coffee. On the surface of the coffee appear moving, painted images culled from her personal life and from the news. A viewer might see an image of Michael Jackson and then a grocery list. Jordon’s recent success comes at a time when everything else in her life seems to have aligned. Her family, now living in a beautiful old home in northwest Portland, is healthy, and she continues to teach a full load of classes at OSU, including painting and a contemporary issues class for art majors that she helped to design. She also paints herself as a student – now learning video software programs such as Final Cut Pro and getting help from both her art students and students in OSU’s New Media Communications program to gain the technical skills she needs to accomplish more sophisticated animation. After teaching for 25 years, Jordon is both learning from her students while imparting her own knowledge of traditional painting techniques. And now, it would seem, the sky, creatively speaking, is the limit. Jordon’s newest project is just starting to take shape. Tentatively titled “Anita’s Journey,” the artist found inspiration in the incredible journey of her husband’s now-deceased mother, Anita Greenstein, who spent her childhood hiding from the Nazis in Berlin during World War II. In June, Jordon traveled to Berlin to research “Anita’s Journey” with the help of awards from OSU’s Center for the Humanities and Valley Library as well as the Oregon Arts Commission. Before she left for Berlin, she received an international honor: The Jerusalem Cultural Fellowship named her one of four fellows for a pilot program for artists to work in the historical city. The Oregon Jewish Museum, which exhibited “Family History” in 2009, had nominated her. Also joining her were acclaimed novelists Jonathan Safran Foer and Nicole Krauss; choreographer Reggie Wilson; and New York urban planner Joshua Sirefman. In Jerusalem, Jordon met other artists, including filmmakers and animators who attended an exhibit of her work. Among those were Paul Vester, co-director of the experimental animation program at the California Institute of the Arts. The trips to Berlin and Jerusalem gave Jordon the creative freedom to visualize the place where her husband’s mother was hiding from the Nazis and the time to start shaping those ideas into her next animation. Again, she comes back to the importance of family, and the connections that shape people into who they become. To support the OSU College of Liberal Arts, contact the OSU Foundation. Shelley Jordon grew up in a working class Brooklyn neighborhood. Raised by her single mother, she doesn’t remember any artists in her family but was praised for her artistic talents by teachers early in her education. She received a college scholarship to attend the School of Visual Arts in Manhattan, where she focused on illustration. After receiving her master’s degree in fine arts from Brooklyn College in the late 1980s, Jordon said she was offered three full-time teaching positions – one in Chicago, one in California and one at OSU. At the time, Jordon said she didn’t know where Corvallis was on a map. She felt like a fish out of water in a small community and after a few years started looking at Portland. Living in a loft with no closets but what Jordon describes as an “amazing raw space with fantastic light,” she had the freedom to paint in what would become her defined style for many years. Jordon was an acclaimed painter of still-life images, many of which were up to 12 feet tall. Jordon met her husband David in the laundry space of the building and soon, both her personal life and her career came together. “When I moved from Manhattan to the loft in Portland, the paintings got bigger, and gradually the compositions changed, became less compressed, and the skies became more open,” she adds. The paintings from this period include “Sweet Delicata,” a piece on permanent display at OSU’s Valley Library. Jordon has never worked from photographs as some still-life painters do. She has always used what was around her, so as she moved physical locations, her paintings changed. “Any of my paintings that I look at, I know where I was not only internally and emotionally, but also geographically,” she says.